2.1.1 Can you explain the functions of the different components in the wheat grain and, after milling, their contributions to the manufacture of baked products? 2.1.2 We understand that millers often use a mixture of different wheats to manufacture the flours that they supply to us. Can you explain why they do this? 2.1.3 Why are there so many varieties of wheat and how are they classified? 2.1.4 We have heard several experienced bakers talking about the ‘new harvest effect’ and the problems that it can cause. Can you explain what is behind this phenomena and how we can mitigate its effects? 2.1.5 We are a bakery working with a local farmer and miller to produce a range of local breads and want to use some different varieties and forms of malted grains that we are producing. Can you advise us on any special issues that we should be aware of? 2.1.6 Can we mix oats or oat products with our wheat flours to make bakery products? If so, are there any special issues that we should be aware of? 2.1.7 What is micronised wheat? 2.2.1 Can you explain what the ash content means and should we ask for it to be determined on our flours? 2.2.2 What does the term grade colour figure mean in flour specifications? How is it measured? What are the implications for bread quality? 2.2.3 We have the water absorption capacity of our flour assessed regularly but find that this is different to the actual water level that we use in the bakery. What are the reasons for this difference and is it important for breadmaking? 2.2.4 What effects will variations in flour protein content have on baked product quality? How is the property measured? 2.2.5 There are many references to protein and gluten quality in the technical literature, how important are these properties for bread and other baked products? 2.2.6 I have seen that there are several different methods which can be used to assess flour protein quality, which one gives the most meaningful results? 2.2.7 We have been using a flour ‘fortified’ with dry gluten for breadmaking. The bread is satisfactory when made on a high-speed mixer but so less when we use a low-speed mixer. What is ‘dry gluten’ and can you explain why we get different results when we change mixers? 2.2.8 Why is the protein content of wholemeal bread flour typically higher than that of white flours but the bread volume is commonly smaller with the former? 2.2.9 We get a significant variation in the quality of our wholemeal bread and rolls depending on which flour we purchase. What characteristics should we look for in a wholemeal flour specification to get more consistent results? 2.2.10 What is the Falling Number of a flour, how is it measured and what values should we specify for our flour miller? 2.2.11 What is damaged starch in flour? How is it damaged and how is it measured? What is its importance in baking? 2.2.12 What characteristics should we specify for white bread flour and why? 2.2.13 As enzymes such as alpha-amylase are inactivated by heat during baking, is it possible to use heat treatment of flour to inactivate the enzymes in low Hagberg Falling Number flours before baking? 2.2.14 We are considering making traditional German-type rye breads and have researched the recipes and production methods. Do you have any suggestions as to what characteristics we should have in the rye flour? 2.2.15 We wish to add non-wheat fibres to some of our baked products to increase their healthiness. What fibres can we used, in what products and what potential technical problems should we be aware of? 2.2.16 Why is flour particle size important in cakemaking? 2.2.17 What is heat-treated flour and how can it be used? 2.2.18 What is chlorinated flour and how is it used? 2.2.19 What characteristics should we specify for cake flour? 2.2.20 We have had some wholemeal flour in stock for a while and noticed that it has passed its use by date. Can we still use it? And what are there any related issues with white flours? 2.2.21 What are the active components in self-raising flour? 2.2.22 We have changed suppliers of our self-raising flour and find that we are not achieving the same product volume as before. If we adjust the recipe by adding more baking powder we, find that the products tend towards collapse. Can you explain why and how do we overcome the problems? 2.2.23 What are ‘organic’ flours, how do they differ from other flours and what will be the differences to the baked product? 2.2.24 What characteristics should we specify for our biscuit and cookie flours? 2.3.1 What are the critical properties of fats for making bread, cakes and pastries? 2.3.2 Can you explain the different terms used to describe bakery fats? What are the functionalities of the different forms in baking? 2.3.3 Our bread doughs prove satisfactorily but they do not rise in the oven. On some occasions, they may even collapse and blisters form on the dough surface in the corners of the pans. What is the cause of these problems? 2.3.4 What is the role of fat in the manufacture of puff pastry? 2.3.5 Our puff pastry fails to rise sufficiently even though we believe that we are using the correct level of fat. Are we using the correct type of fat? 2.3.6 What is the role of fat in cakemaking? 2.3.7 We are making ‘all-butter’ cakes but find that after baking they lack volume and have a firm eating character. Why is this and is there any way to improve the cake quality? 2.3.8 We have been using oil in the production of our sponge cakes, but we wish to change to using butter. Can you advise on how to do this? 2.3.9 We wish to produce a softer eating sponge cake and have been trying to add fat or oil but cannot get the quality we are seeking. Is the addition of fat to sponge batters possible and what do we need to do to achieve the quality we are seeking? 2.3.10 We want to make a range of bakery products using butter as the main or only fat in the recipe. Can you advise us of any special technical issues that we need to take into when using butter? 2.3.11 We are using butter in several of our bakery products which comes in chilled at about 4°C (as cartons on pallets) and are encountering problems with variability in its processing. We recognise that is likely to be associated with the temperature of the butter when we are using it. What is the best way to treat the butter to get a more consistent performance? 2.3.12 We are seeking to reduce the level of fat that we use in some of our cake recipes but find that simply taking fat out adversely changes our product quality. What are the possibilities of using ‘fat replacers’ to help us with our strategy? 2.4.1 What type of sugar (sucrose) should we use for the different products that we make in our bakery? 2.4.2 Can you explain some of the main features of alternative sugars to sucrose, and how they might be used in baking? 2.4.3 Why are sugars added to some bread recipes but not others? 2.5.1 The chocolate fondant on our cream eclairs has been falling off the top of the casing and gathers on the tray underneath as a sticky syrup. What causes this and how can we prevent it? 2.5.2 When we changed our supply of bun spice we were using in our Hot Cross buns, we experienced problems with slow gassing in the prover and flowing of the buns during baking. What can we do to avoid these problems? 2.5.3 We wish to use milk powder in our fermented goods and have heard that it is advisable to use a heat-treated form. Can you explain why this is so? 2.5.4 What are the functions of salt in baking, and how do set about reducing the levels that we use? 2.5.5 We are using walnuts in our gateau buttercream filling and find that it turns black. It does not appear to be mould. What is the cause of this discolouration? 2.5.6 What is the role of emulsifier in the production of sponge cake products? 2.5.7 What ingredients are commonly used as preservatives? Are there any particular benefits associated with different ones? 2.5.8 What effect does vinegar have on bread and why is it added? 2.5.9 We have heard that alcohol can be used as a preservative. How is this achieved? 2.5.10 What are the possible alternatives to chemically based preservatives? 2.5.11 What are the differences between diastatic and non-diastatic malt powders, and how can they be used in baking? 2.5.12 We read a lot about the different enzymes which are now available and how they might be used in baking. Can you tell us what they are and what functions they have? 2.5.13 How do anti-staling enzymes work? Can they be used in cake as well as in bread and fermented products? 2.5.14 What is lecithin and how is it used in baking? 2.5.15 We have been having some problems with the quality of our bread, pastries and biscuits and one solution that has been recommended to us is that we should add a reducing agent to our recipes. Can you tell us more about reducing agents, and how they function in baked products? 2.6.1 I have heard that yeast requires oxygen before it can work correctly, is this true? 2.6.2 How does baker’s yeast produce carbon dioxide in breadmaking? 2.6.3 Are there any particular precautions that we should take in handling, storing and using bakers’ yeast in the compressed form? 2.6.4 What are the causes of the dark brown patches we sometimes see on compressed baker’s yeast, and do they have any effect on baked product quality? 2.6.5 We have been advised to store our compressed yeast in the refrigerator but our dough temperature is much higher, is this the correct thing to do? 2.6.6 We have seen references to a ‘lag phase’ for bakers’ yeast; what does this means and what are the implications for baking? 2.6.7 What different types of bakers’ yeast are available? Would there be any particular advantages for us to use an alternative to Saccromyces cerivisii in the manufacture of our fermented products? 2.6.8 What are the correct proportions of acids and alkali to use in baking powders? 2.6.9 What is meant by the term ‘double-acting’ baking powder, and what is the value of using such products? 2.6.10 Why is sodium bicarbonate frequently used alone or in excess to the normal in baking powder for the production of ginger products? 2.7.1 What are bread improvers and why are they used? 2.7.2 What are the differences between dough conditioners and bread improvers? What consideration should we take into account when choosing which one to use? 2.7.3 What are the functions of ascorbic acid in breadmaking? 2.7.4 We have heard that soya flour is added in breadmaking to make the bread whiter. Is this true, and if so how does it work? 2.7.5 I understand that an enzyme called alpha-amylase can be added to flour or dough to improve bread quality but that there are several different forms. I have tried several and get different effects on bread softness. Which one(s) should I use? 2.7.6 Why are emulsifiers used in bread improvers? And how do I decide which one I should be using? 2.7.7 What is L-cysteine hydrochloride, and what is it used for in bread improvers? 2.7.8 Can we add a reducing agent during doughmaking so that we can reduce the energy input required during the mixing? 2.7.9 What is deactivated yeast and how is it used? 4.1.1 We are producing a range of pan breads, some baked in a rack oven and others in a deck oven, and find that there are large indents or cavities in the base of many of the loaves. What is the cause of this effect and how can it be overcome? 4.1.2 We are experiencing a problem with the sides of sandwich loaves caving in. Sometimes, the lid also shows the same problem, though to a lesser degree. Is the problem associated with overbaking? 4.1.3 We are producing hearth-style (oven-bottom) breads, baguettes and French sticks and are experiencing problems with ragged cracks appearing along the sides of the loaves. What are the likely causes of this problem? 4.1.4 We have noticed the development of a ‘fruity’ odour in our breads after they have been stored. The problem is particularly noticeable with our wholemeal products. What is the cause of this problem and are there any remedies we can apply to prevent its occurrence? 4.1.5 When viewing the crumb appearance of our sliced bread, we notice the appearance of dark streaks and patches which have a coarser cell structure and firmer texture than the rest of the crumb. Is this a problem with uneven mixing? 4.1.6 Periodically, we observe the formation of large holes in the crumb of our pan breads and suspect that the adjustment to the pressure set on the moulding board on our final moulder is faulty; can you confirm our suspicions? 4.1.7 We have been having problems with holes appearing in different places in our pan breads. Can you explain where they come from and how to eliminate them? Is there any relationship between the holes that we see inside dough pieces coming from the divider and the problems that we are experiencing? 4.1.9 We are using the Chorleywood bread process to develop our doughs and apply a partial vacuum during mixing to produce a fine and uniform cell structure in the baked loaf. Sometimes, we observe that the cell structure becomes more open even though the vacuum pump is still working. Can you explain the cause of this problem? 4.1.10 We are seeking to improve the quality of our bread products and are getting conflicting advice on what the optimum dough temperature ex-mixer should be. Can you advise us as how to decide what is the optimum temperature to use? 4.1.11 How can I calculate the amount of ice I need to replace some of the added water when my final dough temperature is too warm? 4.1.12 We are using spiral mixers for our bread doughs. What is the best mixing time to use? 4.1.13 Why is it necessary to control the temperature of bread doughs? 4.1.14 We have been experiencing some variation in crust colour on our bread products. What causes bread crust colour and why should it vary? 4.1.15 Why is the surface of some bread doughs cut before baking? 4.1.16 What are the best conditions to use for proving bread dough? 4.1.17 Can we freeze our unproved dough pieces and store them for later use? 4.1.18 What happens when dough bakes? 4.1.19 We make crusty breads in a retail store, and recently, we have been having complaints about our products going soft quickly. We have not changed our recipe or process. Can you help us understand what has happened? 4.1.20 We have been comparing our bread with that of our competitors and find that the crumb of our bread is firmer. Can you explain why? 4.1.21 We are having problems keeping a uniform shape with our bloomers. They tend to assume a bent or ‘banana’ shape. This happens even though we take great care to straighten them when they are placed on the trays. Can you explain why we get this problem? 4.1.22 We have been taught to always place the seam of our moulded bloomer dough pieces downwards on the tray before proof, but we do not take the same precautions with our pan breads. Can you explain the relevance of placing the bloomer dough piece ‘seam’ down? Should we also do this with our pan breads? 4.1.23 Can we make bread without using additives? What will be the key features of the ingredients and process that we should use? 4.1.24 We make bread and rolls using a bulk fermentation process; can we use ascorbic acid (AA) to improve our bread quality? 4.1.25 We have had bread returned to us by the retail store through which it is sold. They are not satisfied with the quality. We have some pictures of the products concerned. This seems to be a ‘one-off’ and we are at a loss to understand what has led to the problem. Can you help us understand where the problem came from? 4.1.26 We have noticed that loaves sometimes break only on one side of the pan but that the break is not formed consistently on one side. Can you explain why this is? 4.1.27 We are making a range of crusty breads using a small bread plant. We appreciate the value of having an open cell structure to encourage the formation and retention of the crust. However, from time to time, we have difficulty in achieving the desired degree of openness in the structure. Can you help us identify why this happens? 4.1.28 During the manufacture of bread and other fermented products, we sometimes have small quantities of ‘leftover’ dough from a mixing, can we add these back to other mixings or reuse it in other ways? 4.1.29 Our total time for bread production from flour to baked loaf is set for about 6 hours. Currently, we use a bulk fermentation time of 4 hours and a final proof time of 90 minutes. We find that with increased bread sales that we do not have enough proving capacity. If we were to shorten the final proof time what other changes would we have to make to maintain our current bread quality? 4.1.30 In breadmaking, what is the difference between a sponge and a ferment and when would they be used? We have also seen references to barms, can you tell us anything about these as well? 4.1.31 How would we prepare and use a sponge with the Chorleywood bread process (CBP)? 4.1.32 Our bread and buns prove to a satisfactory height in about 50 minutes, but we get no additional lift from the products in the oven. We have tried increasing its strength and using more improver, but whatever we do we see no oven spring. Do you have any ideas as to why we are getting no oven lift? 4.1.33 We are experiencing a problem with loaves baked in rack ovens since we bought new pans. As the enclosed photograph shows, they are joining together above the pans. The portions of the loaves that touch have no crust formation which makes them weak when they are depanned and handled. How can we prevent this from happening? 4.1.34 We wish to create a bolder shape and more open cell structure with our crusty sticks and have recently increased our dough development by mixing longer. Now, we experience problems with the products joining together in the oven. If we under-prove the dough pieces, we have problems with ragged bread and poor shapes. Should we reduce our mixing time back to its original level? 4.1.35 We are finding that the crumb of our bread is too soft for slicing. We also notice a tendency for the sides of the loaves to slightly collapse inwards. We do not think that conditions in our cooler have changed can you please advise us of what to investigate? 4.2.1 Can you suggest what steps could be taken to prevent our round doughnuts shrinking or collapsing within a few minutes of leaving the fryer? 4.2.2 The fermented doughnuts we are making tend to be quite greasy to eat. Can you advise on how we can reduce this problem? 4.2.3 We have recently been experiencing difficulties with the production of our bread rolls. The finished rolls have poor volume with large holes in the crumb. Can you suggest measures we might take to eliminate these faults? 4.2.4 We have been receiving complaints that our small fermented products, such as rolls, teacakes and baps, are staling too quickly. Can you advise on how we can improve the product softness? 4.2.5 Our fruit breads rise very slowly in the prover and fail to rise any further in the oven. We make some unfruited products with the same formulation and they are satisfactory in all respects. Can you explain why? 4.2.6 Our fruited buns frequently collapse when they leave the oven. We have tried baking them for longer but this does not cure the problem. Our fruited loaves made with the same dough do not have the problem. Can you advise? 4.2.7 We are making a fruited bun product and from time to time experience problems with the product flowing out during proof and baking. Can you identify the cause and suggest a remedy? 4.2.8 When we cut open bread rolls and hamburger buns which have been stored in the deep freeze for a period of time, we observe a white ring just inside the crust which has a hard eating character. Where does this problem come from? 4.2.9 We are not a large bakery but are planning to part-bake and freeze bread products for bake-off at some later time; what points should we be aware of? 4.2.10 When we reheat par-baked products we find that they remain soft for only a short period of time, typically an hour or so, but they quickly go hard and become inedible. If we do not reheat them, we find that par-baked products can stay fresh for several days. What causes the change in the rate of firming? Is it the additional moisture lost on the second bake? 4.2.11 While reading about the manufacture of hamburger buns, we see references to the pH and TTA of the brew. What do these terms mean? When are they used and what is the purpose of controlling them? 4.2.12 We have problems with our retarded teacakes which have large holes underneath the top crust. We do not experience the same problem with scratch-made products. Why is this? 4.2.13 When we retard our rolls before proving and baking we sometimes see a dark mark on the base immediately after baking and cooling. We see similar problems with our retarded doughnuts. Is this mould because we have left the products to cool on the trays before wrapping? We use silicon paper to bake on, does this aggravate the problem? 4.2.14 We are retarding our roll and stick doughs overnight but find that the products made baked from them are covered with many small, white, almost translucent spots on the surface. We do not get the same problem with our scratch production using the same recipe. Can you give an explanation for their appearance and advise on how to get rid of them? 4.2.15 We have been experimenting with retarding fruited rolls and buns. We find that the smaller products are quite satisfactory but loaves made using the same formulation and baked in pans have ‘stains’ around the fruit pieces and a darker crust colour than we would like. Can you please advise us on how to cure these problems? 4.2.16 We are retarding rolls in our retarder-prover and find that they lean to one side and lose weight during storage. Can you advise us as to how to cure these problems? 4.2.17 We are producing a variety of finger rolls using white flour. The rolls must be soft eating and retain their softness for several days; to achieve this we are using a roll concentrate. To help us cope with fluctuations in demand we freeze a proportion of our production, but find that the defrosted product is very fragile and may even fall apart. Can you help us overcome this problem? 4.2.18 Can you tell us something about Chinese steamed breads and their production? We make our standard breads using the Chorleywood bread process, would we be able to make these products using this process? 4.2.19 What is cinnamon twist bread and how could we make it? 5.1 What is the flour-batter method of cakemaking? 5.2 What is the sugar-batter method of cakemaking? 5.3 Why do our cake batters made by the sugar-batter method sometimes have a curdled appearance? And does this affect final cake quality? 5.4 We are experiencing some variation in cake quality, especially volume. How important is it to control the temperature of our cake batters? 5.5 How do we calculate the likely temperature of our cake batter at the end of mixing and what temperature should we aim for? 5.6 We use an all-in cakemaking method for the manufacture of our plain cakes. Occasionally, we experience loss of volume and the top of the baked product becomes peaked rather than flat. It has been suggested that we are over-mixing the batter and developing the gluten in the flour; is this correct? 5.7 When making fruit cakes, we find that the fruit settles to the bottom of the cake after baking. Why is this? And what can we do about it? 5.8 Can we freeze cake batters and what happens to them during storage? 5.9 Why do cakes go mouldy? 5.10 In the light of the previous question, why do heavily fruited cakes go mouldy more slowly? And are there any special conditions we should observe while making Christmas puddings? 5.11 Unexpectedly, we are getting mould between our decorated cakes and the board on which they sit. Why should this happen? 5.12 We are experiencing mould growth on the surface of our iced Christmas cakes. This is the first time we have had this problem and cannot explain why. Can you? 5.13 We are experiencing a ‘musty’, off-odour developing in our cakes, even though we store them in a deep freeze. Can you advise? 5.14 We regularly measure the water activity of the individual components in our composite cake products and try to adjust them to reduce the differential between them to reduce moisture migration. Even though we do this, we are still having problems keeping the cake moist during shelf-life. Can you give us some advice as to what we may be doing wrong? 5.15 When we take our cup cakes from the oven, we find that the paper cases they were baked in fall off. How do we avoid this problem? 5.16 Our small cakes often shrink excessively during cooling. How can we avoid this? 5.17 Our cake sheets tend to lack volume, are uneven in shape and have cores in the crumb. Can you advise? 5.18 Sometimes, our unit cake has a poor (coarse) texture. How can we improve it? 5.19 What are the causes of the small, white speckles we sometimes see on the crust of our cakes? 5.20 We are getting an orange discoloration of the crumb of our fruit cakes. Can you offer an explanation? 5.21 When we add fresh fruits such as blackcurrants to our cake batters, we sometimes find that they fail to keep their colour during baking and often discolour the batter adjacent to the fruit. Can you offer an explanation and a solution to the problem? 5.22 We are baking fruit cakes using sultanas and find that while the centre of the crumb is a nice golden yellow around three sides of the cut face of the cake (the bottom and the two sides) the colour is much browner and darker in colour. Can you help us identify the cause of this problem? 5.23 We are using natural colours in our slab cake baking and find that we get variable results, not just from batch to batch but sometimes within a batch. Can you suggest any reasons for this problem? 5.24 We are getting large holes in the crumb of our fruited slab cake but are not sure why this is happening. Can you offer some advice? 5.25 Our sultana cakes are collapsing. What can we do to remedy this problem? 5.26 Why do cakes sometimes sink in the middle? 5.27 We are encountering an intermittent fault with our round high-ratio cakes in that a shiny ring with pitting is seen on the cake surface. What factors are likely to give rise to this fault? 5.28 Our fruited cakes are fine to eat soon after production but tend to become drier eating after a few days; why is this? 5.29 We have seen that our cake quality varies when we change from one type of oven to another, even when they register the same temperature. Why is this? 5.30 How important is the temperature of cakes at the point of wrapping? 5.31 What precautions should we take when freezing cake and sponge products? 5.32 What happens to the batter when cakes enter the oven, and how can you tell when a cake is baked? 5.33 What are the advantages of having the oven filled when baking slab or other cakes? 5.34 Why do we add extra acid to make white cake batters? 5.35 We have been making a range of different cake sizes using the same plain batter and get varying quality results in terms of their shape and appearance despite having adjusted the baking conditions. Do you have any advice? 5.36 We would like to change the physical dimensions of some our cake products to make different sizes and shapes Do you have any advice that you can give us as to how to adjust the batter deposit weights for the different pan sizes? 5.37 We have recently changed the acid that we use for our baking powder mix and have adjusted the neutralising value accordingly. Subsequently, we have been having some problems achieving the volume and shape that we want with our small cakes. Can you explain why we are having these problems? 5.38 What are the factors which control the shape and appearance of the top of a cake? 5.39 Currently, we add alcohol, in the form of spirits or liqueurs, to our celebration cakes after they have been baked and cooled. We leave them for a few days after treating them, but this is taking up a lot of space. What advantages/disadvantages would there be if we add the alcohol to the batter before baking? 5.40 Why do some traditional sponge cakemaking methods specify a delay in the addition of the sodium bicarbonate and the use of hot water? Would this approach have any practical applications today? 5.41 We have been experiencing problems with collapse of our sponge sandwiches which leaves the product with a depression forming on the top of the cake and an area of coarse cell structure in the crumb. What causes this problem? 5.42 Recently, we have been experiencing problems with our sponge sandwich cakes assume a peaked shape during baking. We have not changed ingredients or recipe. Can you suggest why we are having this problem? 5.43 We are having problems with the bottom crust of our sponge cake products becoming detached after baking. We also notice that the corners of the product become rounded and the texture close. Can you offer any explanation for these problems? 5.44 When making sponge drops, we find that the last ones to be deposited are not as good as the first ones. Why is this? 5.45 From time to time, we experience problems with Swiss rolls cracking on rolling. Can you help identify the causes of the problem? 5.46 What are the key elements to consider when making chocolate cakes with cocoa powder? 5.47 We have been making cake muffins and find that when we cut them open, they have large vertical holes in the crumb. Why is this and how do we eliminate them? 5.48 Why do some of our cake muffins lean to one side during baking? 5.49 What is Baumkuchen and how is it made? 6.1 How important are the dough and batter temperatures in biscuit, cookie, cracker and wafer making? 6.2 What is ‘Vol’ and what is its function in biscuits doughs? 6.3 A batch of our biscuits containing oatmeal has developed a ‘soapy’ after-taste which makes them unpalatable. Why is this? 6.4 From time to time, we have noticed a white discolouration on the surface of our all-butter shortbread. Can you explain why this occurs? 6.5 We produce biscuit-containing powdered fructose which we cream with the fat and sucrose before adding the other ingredients. Recently, we have seen the appearance of brown spots on the product. Do you know what causes this effect? 6.6 How do biscuits and crackers get broken during storage, even if they are not disturbed? Can we stop this from happening? 6.7 We are making a ginger crunch cookie, but find that we experience variations size. Can you advise? 6.8 When making ginger nuts, we find that we do not always get the degree of cracking that we would like. Why is this? 6.9 We are trying to make soft-eating cookies and are having a degree of success with the recipe that we are using. The products are not expected to have a long shelf-life, but we find that they are going hard too quickly. Can you suggest any ways of extending the period of time that the cookies will stay soft eating? 6.10 We assemble a selection pack of biscuits and cookies, one of which is a rectangular product coated on the top with icing. When the pack is opened after sometime this coated biscuit has a ‘bowed’ shape, the base is soft eating but the icing remains hard. Can you suggest reasons for these changes? 6.11 We are experiencing dark brown specks on the surface of our plain sheeted biscuits. We have been using the same recipe for a number of years without a problem. Can you identify the cause of the specks and suggest a remedy? 6.12 We are having some problems with packing our rotary moulded biscuit lines. When we measure the thickness of the biscuits, we have noticed that some are thicker than others. Can you suggest any reasons why we should be getting such variations? 6.13 We are having intermittent problems with shrinkage of our semi-sweet biscuits after they have been cut out from the dough sheet. How can we stop this from happening? 6.14 We are experiencing blistering on the surface of our semi-sweet biscuits and sometimes see cavities under the top crust and little hollows on the bottom. Can you identify possible the possible cause of the problem and suggest a solution? 6.15 We are manufacturing short-dough biscuits using a rotary moulder and have been offered an alternative supply of sugar. We notice that the new sugar is more granular than the material we have been using previously; would this have any effect on biscuit quality? 6.16 Is it possible to reduce the level of sugar in our biscuit and cookie recipes without affecting their quality? What would be the alternatives we could use to sucrose? 6.17 We would like to reduce the level of fat in our biscuit recipes. How can we do this? 6.18 What are main issues that we should be aware of in the manufacture of savoury puff biscuits? 6.19 Is it important to use a fermentation period in the manufacture of crackers? What effects are we likely to see from variations in the fermentation time? 6.20 We have installed a new cutting and creaming machine for the preparation of our sandwich wafers and refurbished the production area. We have found that we are now getting intermittent problems with the wafer sheets breaking up on cutting. Can you offer an explanation as to why this might be happening? 6.21 Our chocolate-coated wafer biscuits are prone to cracking. Can you suggest why this happens and how we can avoid the problem? 6.22 We are experiencing intermittent problems with gluten formation in our wafer batter. What causes this problem? 6.23 What are Shrewsbury biscuits and how are they made? 6.24 We find that our Viennese fingers go soft very quickly after baking. How can we prevent this from happening? 7.1.1 What causes puff pastry to rise during baking? 7.1.2 We are experiencing a problem with our puff pastry which fails to lift and shows no sign of layering on baking. Why is this? 7.1.3 Why do we get a less regular lift in our puff pastry when we use the Scotch method compared with the English or French? 7.1.4 What are the purposes of the resting periods in the manufacture of laminated products? 7.1.5 We have been experiencing some problems with excessive shrinking of our puff pastry products. Can you advise as to what the likely causes might be? 7.1.6 Why are acids sometimes added to puff pastry? 7.1.8 We are experiencing problem with the discolouration of unbaked puff paste stored under refrigerated conditions. Sometimes black spots appear on the surface. Can you explain why this happens and advise on how to avoid it? 7.1.9 We have been experiencing considerable variability in processing our short and puff paste products; sometimes, we have problems with paste shrinkage and on other occasions we get stickiness. We have checked our weighing systems and can find no problems with ingredients additions. We have no climatic temperature control in the factory or ingredient storage facilities, are these likely to significant contributors to the problems? 7.1.10 Why should croissant and Danish pastry doughs be given less lamination than puff pastry? 7.1.11 What is the optimum level of fat to use in the production of puff pastry? 7.1.12 We would like to reduce the level of fat that we use to make our puff pastry but would like to retain pastry lift. Can you provide us with some guidance as to how we might achieve our objectives? 7.1.13 We are experiencing distortion of our pastry shapes. We have measured the shrinkage but find that it is not even. We have also noticed that the laminated products are experiencing some variation in product lift. What might be the causes of these problems? 7.1.14 We are looking to start production of croissant. In my travels, I have seen many variations on products which are called croissant. Why are there so many different forms and how are they made? 7.1.15 We wish to make croissant with the moulded ends joining to form a circle but find that they open up during baking. Can you suggest how we can overcome this problem? 7.1.16 We have been trying to freeze fully proved croissant for later bake-off. Can you identify the important criteria for their successful production? 7.1.17 We are making puff pastry, Danish pastries and croissant using all butter and often have problems with the processing of the pastes and feel that we do not get the best of quality from the final products. What are the best processing temperatures and conditions when using butter with such products? 7.2.1 What characteristics should we specify for the flour that we should use for making savoury and sweet short pastes for unbaked chilled and frozen shells and scratch-baked products? 7.2.2 Why is the hot water method preferred for the production of savoury pastry but not for sweetened pastry? 7.2.3 What method should we use to calculate the water temperature to deliver a consistent final savoury short paste temperature at the end of mixing? 7.2.4 We are manufacturing savoury short pastry products which are blocked out to shape and lids by sheeting a paste with the same formulation. We wish to increase our production rate and are considering reducing or eliminating the rest periods in the production sequence. Can you advise us on their function and any consequences that we may face if we change them? 7.2.5 From time to time, we experience problems with the sheeting of our short paste, in particular it cracks or fails to remain cohesive. Can you suggest why this happens? 7.2.6 We are producing unbaked meat pies but find that the short pastry lid cracks on freezing. The cracks become larger when the product thaws out and during baking the filling may boil out leaving an unsightly blemish on the surface. Why is this and what can we do about it? 7.2.7 Some of the short pastry cases that we make for restaurants to fill and serve have been returned to us as being ‘mouldy’ on the base. We were surprised as we thought that the water activity of the shells was too low to support mould growth, and when we examined the bottom of the pastries, we can see that there is a discolouration but we do not think that it is mould. Can you identify what has caused the discolouration and how to eliminate it? 7.2.8 We are having problems with the custard tarts that we make. The pastry shell is very pale coloured, but if we increase the baking time, we find that the custard filling is not very stable and shrinks away from the case during storage. If we raise the baking temperature, the custard filling boils and breaks down during storage. Can you give us any advice on how to get a better pastry colour without causing problems with the filling? Sometimes the baked custard has a watery appearance. 7.2.9 We have been receiving complaints from customers that that our short pastry which we use for meat pie products has an unpleasant eating character which they describe as ‘waxy’. The comments are most often related to the base pastry in the pies. Why is this? 7.2.10 Why does our pork pie pastry go soft during storage and what can we do to make our pastry crisper? 7.2.11 We are having difficulty in blocking out savoury pie paste in foils, there is a tendency for the dough to stick to the die block causing the base of the foil case to become misshapen. We do not have the same problems with our sweetened paste, can you explain why? 7.2.12 Why do our baked pastries and quiches have small indents in the base which project upwards and are pale in colour? They are baked in individual foils. 7.2.13 How can we make the sweet pastry that we use with our apple pies crisper eating? 7.2.14 How do we avoid ‘boil-out’ of our pie fillings? 7.2.15 We wish to reuse pastry trimmings but find that sometimes we experience a ‘soapy’ taste in the final product. Can you suggest a cause for the flavour and how best to reuse the trimmings to avoid this and any other potential problems? 8.1 What are the most important factors which control the volume of choux paste products? 8.2 Why are cream buns baked under covers and eclairs are not? 8.3 Our choux buns collapse during baking. Can you suggest why this happens? 8.4 We are getting a grey–green colouration to our choux buns. Can you explain why this should happen? 8.5 Why is powdered ammonium carbonate or ‘vol’ added to choux paste? 8.6 We wish to make a large batch of éclair cases and store them for a few days before filling and icing them. Can you advise on the best way to keep them to preserve their quality? 8.7 We stand our finished choux buns on U-shaped cardboard and wrap them in a cellulose-based film. Recently, we have observed the growth of mould colonies on the products. Why is this? 8.8 Our scones are made from frozen dough but frequently lack volume. We also find that the crumb colour is rather brown. Can you offer suggestions to improve our product quality? 8.9 Some of our scones have a coarse break at the side and an open crumb cell structure but the results are not consistent. Can you please suggest steps we might take to obtain a better and more consistent product quality? 8.10 We wish to extend the shelf-life of our scones. How can we do this? 8.11 The surface of our scones is covered with speckles of a yellowish-brown colour. We are using GDL as the acid component in the baking powder. Can you suggest why we have this problem? 8.12 Why should particular care be taken when washing scones with egg wash to ensure that none runs down the sides of the pieces of dough? 8.13 We are freezing a range of unbaked, chemically aerated products including scones and cake batters and now want to include some variations using fresh fruits. We have carried out a number of trials and have a range of issues which are mostly related to the fragility of the fruit. Can you provide some advice? 8.14 We have been asked to improve the sensory qualities of our scones and have been able to do this by a number of recipe changes. Although these changes have been largely satisfactory for our plain scones the fruited varieties, we make stil tend to be too dry eating. Do you have any suggestions as to how we can make them more moist eating? 8.15 We make and bake scones on a daily basis. Recently, we placed them unbaked in a refrigerator but the baked quality was poor. We used a retarder instead but we still find that the products were small in volume. Is it possible to retard unbaked scones and still produce an acceptable product? 8.16 I am having difficulty with Royal icing which will not harden adequately. Can you advise? 8.17 I have heard that off-odours can be caused by the icing used for cake decorations. Is this true? 8.18 After 2 days our royal icing tends to turn yellow. Can this discolouration be prevented? 8.19 We are receiving complaints of opaque spots on our fudge icing. Can you suggest a remedy? 8.20 After storing our coated products overnight, we find that cracks form in fondant coating. Can you suggest ways to overcome this problem? 8.21 We make sugar paste shapes and store them in plastic containers for later use. In a few days, the shapes soften and are inclined to droop. Can you suggest how we might overcome this problem? 8.22 We would like to store our heavily fruited wedding cakes after coating with marzipan for some time before we ice them but find that the marzipan hardens. Why is this and how can we achieve our aims? 8.23 We are not getting the quality of finish that we would like from the fondant we are using, often the finished products lack gloss. Can you give us some tips on how to improve our use of the fondant? 8.24 We bake our meringues on aluminium sheets and are having problems with the meringues becoming discoloured. Can you offer any advice on how to eliminate this problem? 8.25 When making Italian meringues why is the boiling sugar water added slowly? 8.26 We are experiencing cracking of our meringue shells during baking. Why is this? 8.27 We are having problems with softening of coffee meringues in which we use coffee powder as the flavouring. Is this the cause of the problem? 8.28 On some occasions, our almond macaroons exhibit very coarse cracks on the surface instead of the fine cracks we are seeking. We have not been able to trace the cause, can you help? 8.29 What are stotty cakes and how are they produced? 8.30 Why does our whipped cream collapse on standing? 8.31 Recently, we experienced a problem with a fishy taint in a batch of buttercream. Can you suggest why? 8.32 We are experiencing seepage of our jam in our frozen fresh cream gateau when they are thawed; can we avoid this? 8.33 We have recently been experiencing ‘weeping’ from our non-dairy cream formulation. This shows itself as a ‘soggy’ layer where the cream is in contact with the cake. Can you please advise on how to cure the problem? 8.34 How can we prevent our apple pie filling going mouldy within a few days without changing the filling recipe? 8.35 In some of our apple pies, we find that the filling has turned blue. Why should this happen? 8.36 Can you suggest a solution to the problem of shrinkage in our apple pie filling? 8.37 Why have our crumpets lost their characteristic surface holes? 8.38 Why is a small amount of bicarbonate of soda added to pikelet batters just before baking? 8.39 The chocolate coating on our marshmallow teacakes cracks during storage. Can you offer an explanation and solution to the problem? 8.40 What causes the white bloom which sometimes occurs on chocolate coatings? 8.41 The bakers’ chocolate coating we use has recently tended to flake off our eclairs. Can you identify a likely cause of the problem? 8.43 What are Staffordshire oatcakes and how are they made? 8.44 What are farls and how are they made? 8.45 The edges of our soda farls become gummy a couple of days after baking. What is the cause of this quality defect? 8.46 We want to add freshly baked deep-pan pizza to the product range that we sell through our bakery shop. We do not want to make small quantities of dough throughout the day for their manufacture, but when we try to work with a larger bulk of dough, we find that the variation in quality is too great, even when we refrigerate the dough in our retarder. What would be a suitable way for us to make the bases? 8.47 We freeze our unbaked pizza bases in a nitrogen tunnel. On defrosting and baking, we get bubbles forming on the top of the base accompanied with an open crumb cell structure. Can you suggest ways of overcoming these problems? 8.48 What are the key characteristics of cake doughnuts and how do they differ from other types of doughnut? 8.49 We have been producing a range of cake doughnuts which are iced with various flavoured coatings. To cope with peak demands, we have taken to freezing a quantity of the products. We have observed that progressively during storage a crystalline growth appears on the products. When they are defrosted the growth disappears. Can you identify why this happens? 8.50 After a short period of chilled storage, we observe crater-like crystalline formations on our cheesecake topping. Do you know why this occurs? 8.51 We want to extend the mould-free shelf-life of our flour tortilla (Fig. 8.4) but when we try the dough more acid we have processing problems. What options could we consider for achieving our aim? 8.52 What are the origins of pappadams? 8.53 What is kebab bread? 8.54 What is balady bread? 8.55 How are chapattis made? 8.56 What are corn (maize) tortillas? And how are they made? 8.57 What is trencher bread and how was it used? 8.58 What is the product known as a Grant loaf? 9.1 I see many references to ‘no-time’ doughmaking methods. What does this term mean and what is its relevance? 9.2 We are considering the purchase of a new mixer for the manufacture of our bread using a no-time dough process. There are two types of mixer which seem to be appropriate for our plant production needs, the spiral-type and the CBP-compatible type, but before making our decision, we need to understand any issues with respect to dough processing and final bread quality. Can you please advise us? 9.3 Can you explain the role energy in the Chorleywood bread process? 9.4 We are looking to buy a new final moulder for our bread bakery. Can you advise us on the key features which should look for and how they might impact on final bread quality? 9.5 Why is a bread dough piece coiled after sheeting? Does the number coils achieved have any impact on bread quality? 9.6 What is the function of four-piecing or cross-panning in breadmaking? 9.7 What is purpose of the ‘knocking-back’ the dough when using a bulk fermentation process to make bread? 9.8 We have two bread lines running side-by-side with the same equipment bought at different times. We are using the CBP and do not quite get the same volume and cell structure when making the same pan bread product. We compensate by adjusting yeast and improver level but do not get the same crumb cell structure. Can you help us understand what is happening? 9.9 We have both spiral and twin-arm type mixers and would like to produce a finer cell structure with our sandwich breads; can you suggest ways in which we might achieve this aim? 9.10 We have been freezing some of our bakery products to have products available in times of peak demand. We notice that there is ‘snow’ or ‘ice’ in the bags when we remove them from the freezer. Can you tell us why this happens and how it can be avoided? 9.11 We have been deep freezing bread products and experience a number of problems with different products. With crusty products, we observe that the crust falls off while with some other products we find that longer periods of storage lead to the formation of white, translucent patches in the crumb which are very hard eating. Are the problems related to the performance of our freezer? 9.12 We have seen references to the Milton Keynes process but can find very little technical information on the process. Can you tell me what it is (was) and how it is (was) used? 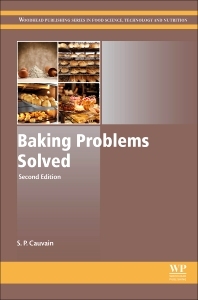 9.13 Can you explain the principles of vacuum cooling of baked products and its potential applications? 10.1 What is meant by hydrogen ion concentration and how is the pH scale determined? 10.2 In some technical literature, there is reference to batter specific gravity or relative density. What is this? How is it measured? And what is its relevance to cake and sponge making? Why is the volume of the baked product referred to in terms of specific volume? 10.3 What value is there in measuring colour of bakery products and how can we carry out the measurements? 10.5 How can we measure baked product shape and volume? 10.6 What is the phosphatase test? 10.7 What is the Bohn’s spot test and what is it used for? 11.1 What is the meaning of the term synerisis when applied to bread? 11.2 What is a super-saturated solution? 11.3 I have heard the terms ‘glycaemic index’ and ‘glycaemic load’ used when describing bakery products. What are they and what is the difference? 11.4 What are pro- and prebiotics and how can they be used in our bread products? 11.5 Can you please explain the difference between hydration and hydrolysis? What is their relevance to the manufacture of baked goods? 11.6 What is meant by the term ‘glass transition temperature’ and what is its relevance to baking? 11.7 What does the term MVTR mean when applied to packaging, and what is the relevance to baked products? 11.8 What is meant by the term ‘modified atmosphere packaging’ and how can we use this approach in the production of baked products? 11.9 We have heard people referring to synergy in the use of ingredients in baking processes, what is this process and can you identify any examples? 11.10 What are polyols and how are they used in baking? 11.11 What is acrylamide? Where does it come from and how do we limit it? 11.12 What is osmotic pressure and what is its relevance to baking? 11.13 What is resistant starch? 11.14 What are the origins of the cottage loaf?